I had the great fortune of meeting Dmitry Gudkov, a talented photographer who recently began a series of portraits of people and their bikes. 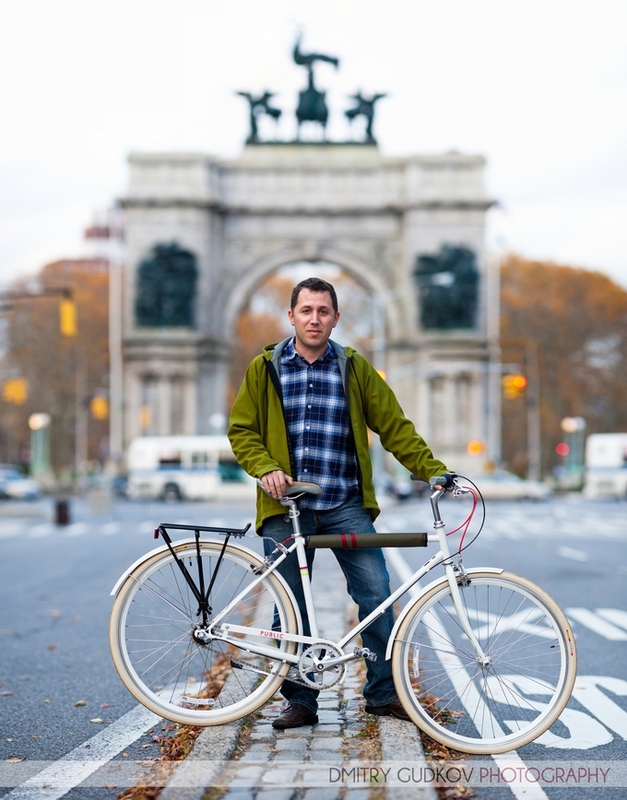 He’s calling his series #BikeNYC after the Twitter hashtag used by cycling commuters and enthusiasts. Dmitry took this amazing picture of me with my PUBLIC D3 in one of my favorite spots in Brooklyn near Grand Army Plaza. He’s a great guy and a very talented photographer. Check out his site for pictures of other cyclists, far more attractive than I. Curious about the pad on the top tube. Where did you source that & have you found it useful? I got it on Etsy from a seller called Die at the Helm. Public also sells one. I find it helpful when I lock up my bike. It prevents scratches. Although in NY it’s likely to get stolen someday.